A chef who sang to impress investors on BBC Two's Dragons' Den has said his supermarket deal is a "dream come true" as his sauce hits the shelves. 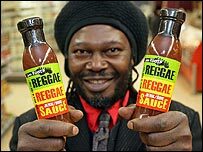 Levi Roots, who was nominated for best reggae singer at the 1998 Mobo awards, persuaded TV entrepreneurs to invest £50,000 in his sauce-making business. His Reggae Reggae Sauce is now on sale in 600 Sainsbury's stores. Mr Roots, from Brixton, south London, said events since appearing on the show had been "amazing and life changing". "The deal with Sainsbury's is a dream come true for me and my family, and seeing the sauce on the supermarket shelves is an emotional but enjoyable moment," Mr Roots added. Dragons' Den judges Peter Jones and Richard Farleigh each paid Brixton-based Mr Roots £25,000 in return for a 20% stake in his company. Mr Jones said: "Levi is a great guy and he's created a great product which he is passionate about. "I am sure this deal with Sainsbury's will be the first of many fantastic milestones on the way to business success and making his dreams a reality." The sauce - an old family recipe - will initially be sold at more than 600 Sainsbury's stores for six months. The supermarket will also sell Mr Roots' record Proper Tings (The Reggae Reggae Sauce Song). The sauce was previously only available on Mr Roots' website or at the annual Notting Hill Carnival. Sainsbury's buyer Nick Paddison said the chain had been hugely impressed with the product. "It fits perfectly with our ethos to encourage customers to try something new and our desire to help nurture smaller, niche suppliers, so we have pulled out all the stops to make it available in stores as quickly as possible," he said.